A popular garden and urban tree, Tulipwood is a beautiful, native, hardy, and well-behaved small tree that suits landscapes well. It’s commonly used along urban coastal roads, as its toughness helps it to thrive in salty areas along ocean shores and in the less than ideal air and soil of the city. Its size makes it a valuable addition from a design standpoint alone, but it’s evergreen foliage, spring blooms and subsequent beautiful fruit make it a very good landscape specimen. It’s also a tree that provides high-quality lumber that is fine grained and dark in color, perfect for furniture making. Harpullias are part of a family of 26 other trees that scientists are studying for its naturally occurring and beneficial chemical properties- specifically for its saponin. Hence it’s family name- Sapinsaceae. Tulipwood is a smaller tree. In the wild it can reach up to 24 metres, but in the urban landscape they are smaller – usually no more than 6 metres in height. It grows in a dense yet round shape, open, yet dense and even. 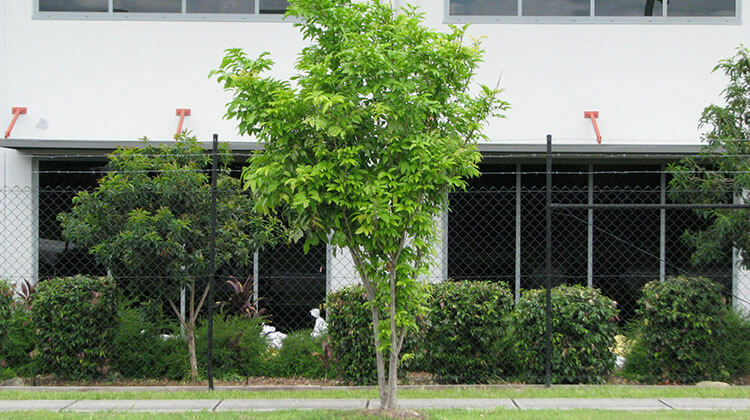 They respond well to tree trimming when carried out according to Australian Standards. 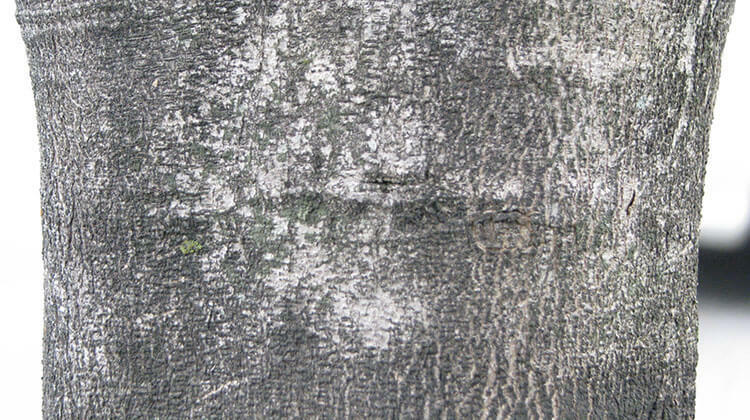 The trunk is an interesting grey color and sports a scaly texture. Despite its even appearance from afar, the trunk and branching structure is beautiful and interesting up close. Light green, 5 petaled flowers on panicles form in the spring/summer (November through January). Dark green leaflets are on one stem, numbering usually between three and eight. They usually measure between five and 12 centimeters each, are smooth on the sides, and are narrow ellipses with pointed ends. 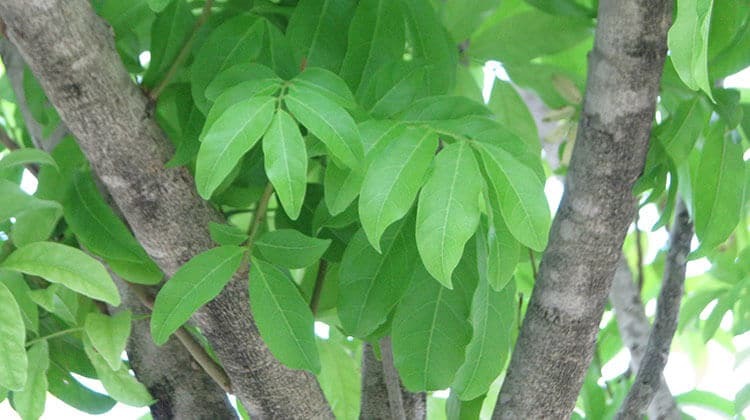 The veins of the leaves are easily visible on both sides of the leaves. This tree is evergreen as well. One of the most attractive things about Tulipwood is its fruiting. From late summer into fall, the bright yellow and red capsules on heavy panicles open, revealing dark and very shiny seeds between the two halves of each capsule. 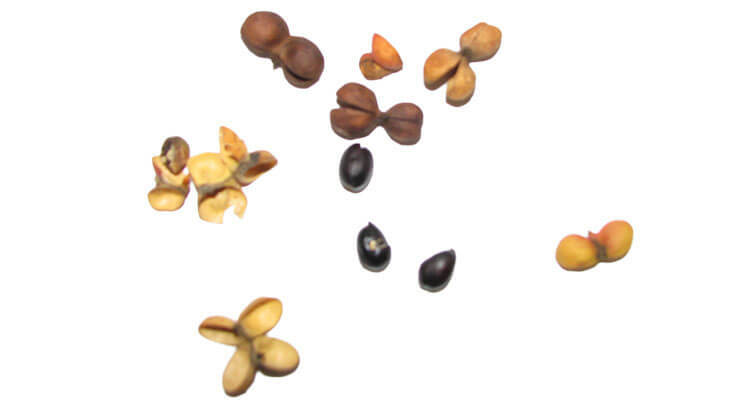 Most often, there are two seed capsule pods for each flower, and they open back to back with their dark shiny seeds facing opposite of each other. This tree is easily started from seed, fresh from the parent tree. Seeds can germinate right away after planting that same season, or sometimes they can take as long as two months. They do best planted right after harvesting for propagating. Harpullia naturally enjoys a wide range of conditions, but thrives best in well-draining soils that are also moisture retentive. They can withstand drying out occasionally after they’ve been established. You don’t need to fertilize established trees, but adding some well-rotted compost or other organic matter to the planting hole of new trees is recommended for some moisture retention and initial feeding for young growth. You can plant this tree near buildings and by sidewalks and roadways, as the root systems are unobtrusive and usually not destructive, though all root systems should be monitored. Tuliptrees grow slowly, but they are healthy and long-lived. Pruning by an arborist is recommended to encourage a central trunk or two is recommended when the tree is young. After they’ve become large and established, they’re virtually care and worry free. 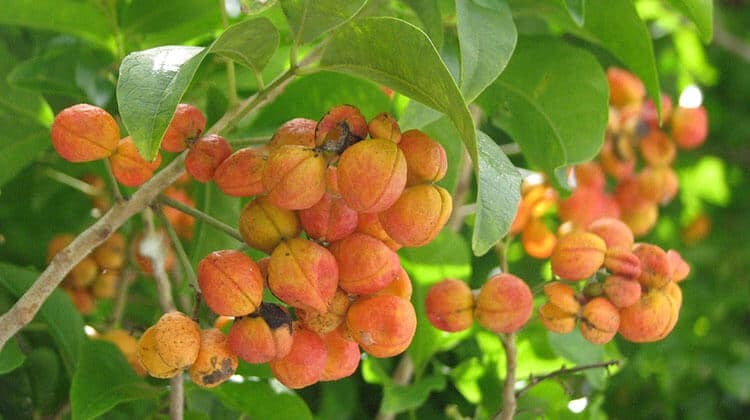 One special note- Tuliptree is dioecious, and requires a male and female tree to set fruit, if fruit is desired. A native Australian tree perfectly suited for urban living and garden cultivation, Harpullia pendula is an ideal candidate for just about every landscape requirement. i have planted two tulipwoods 3 years ago, and they are now only just above fence hieght (about 1.8-2m). i have dug wide holes through existing fill down to natural sand, kept them watered, composted and yet they are still are not growing thick with leaves or as bushy as i thought they should be after 3 years? They are in full sun most of the time in my backyard. I cant understand why they are not growing the way they should? Hi Clint. Are you fertilizing them? It sounds like they need it. We planted a tulipwood 5 months ago and it is approx 2.5m tall with only 2 branches that have just started growing quite high up the main trunk. Would it be ok to prune the main trunk to slow growth down and perhaps encourage a more more bushy shape? Your advice on pruning would be appreciated. Hi Clinton. Tulipwoods are often pruned to be standards by local councils so pedestrians can walk under them. It does weaken the tree as it results in the ‘lion’s tail’ effect. So long as the branches you are pruning aren’t too thick it shouldn’t do real harm to the tree. It was my understanding the the tulipwood tree is evergreen but am reading that it does drop copious amounts of leaves. We live in Port Douglas. I am wanting to plant a tree with its attributes especially the perfumed flowers but am now questioning the leaf drop. Please advise. Hi Mary. All trees drop leaves and replace them, even evergreens. I always recommend an exclusion zone of mulch around trees where leaves will just add to the aesthetic. Council decided to plant Tulipwoods as footpath trees in our street years ago. They shed copious numbers of leaves for most of the year where they blow around and usually end up in the gutters, the footpaths and people’s yards here in Brisbane AU. I can’t say I’m a fan of them, there are better natives to plant. Hi, We have just cut a very large one of these trees down due to the amount of leaves and seed pods that it constantly sheds. We have lived with it for 11 years as was planted already when we purchased our house. It was planted down our driveway and began lifting the concrete driveway which was another reason it has been cut down. Think very carefully before planting if you don’t like constantly sweeping up leaves. I am trying to find a small tree that will provide some shade & privacy to a corner of my yard, but I have a sewerage easement & pit in that corner. Would the Tulipwood be an option and not interfere with the sewerage pipes? They actually grow quite large in their native environment, Angela. If they get into your pipes then they will be monsters. I suggest smaller trees such as dwarf red flowering gum cultivars. Hi, we live at the base of Mt Glorious on 15 acres and 5 of those acres is under cabinet making quality trees consisting of silky oaks, ironwood, black bean and tulipwood to name a few. Most species are doing very well apart from the tulipwood which are either dead or only green growth in the crowns with all lower limbs dead and am wondering if you may have any ideas what may be the cause for this occurrence. The trees have been planted in alternating rows running from top of plantation to bottom and most of the rows of tulipwood are as described above. We have only been on the property for 18 months and when we arrived the plantation had been left to its own to survive thus allowing massive amounts of lantana to rise into the crowns of a lot but not all the trees but particularly the tulipwood. We have been stripping the lantana from all the trees and happy to say we are making great progress in this area. Any advise on the cause and remedy would be greatly appreciated. Hi Peter. The leaves are shade-intolerant. Now that you’ve removed the lantana that was blocking the sunlight they should recover so long as they aren’t crowded. I suggest lots of woodchip mulch so the weeds don’t get a foothold now. Hi Leeanne. I haven’t heard of any problems they may cause and my usual sources don’t indicate they would be a problem. Brisbane City Council favours them for planting on footpaths, and they try to choose the most inoffensive trees they can. Hi David why is it that one of our 11 Harpullia has yellow leaves and stunted height? We’re in a 7 year old townhouse development built on fill which was originally well landscaped. What can I do to help the health of the tree? Hi Maggie. First of all I’d look at its position. If it isn’t getting the sunlight it needs then it won’t improve. If it is, then give it a bit of Urea. I saw this Tulipwood tree growing in a shopping centre and thought what a wonderful tree it would make in the paddocks since it’s foliage is so dense. But I’m trying to find out if it is safe for livestock before I plant them. It would certainly give them great shade and rain protection, but if they eat any dropped leaves or fruit would it make them sick? cheers. Hi Lesley. My usual sources say they have, “no known toxicity” and it’s commonly planted by Brisbane City Council. Gday Lynn, only issue with the Tulipwood in that situation is it drops stacks of leaves. Great for producing leaf litter for use in your garden and great when it rots into the soil – but perhaps not so great if it falls into your pool! Thanks David. I have decided on the tuckeroo. Hi Lyn. Tulipwoods are slower to grow in Brisbane but either could damage the pipes. I’d take the chance but can’t accept responsibility for your choice without assessing the site, sorry. Hello David, I am glad that I stumbled across this blog. I am sure I will be referring to it frequently.We have built a new house and are deciding what to plant where. We live in Maclean in northern NSW on the banks of the Clarence River. I had in mind a leopard tree at the front of the house as it faces west. We need a shade tree that has a canopy for shade that won’t block our view of the river from the window. I thought the leopard tree ticked all the boxes until I read the information you provided about it’s root system and how big it eventually grows. Now I am back at square one and looking for a small decorative tree that will grow a canopy about roof height to shade the front of the house. Ideally the trunk would be located to the side of the window so as to not obscure the view of the river. This one plant is the most important one in the garden because of shade it needs to provide. Can you suggest a suitable substitute for the leopard tree. I looked at your information on tulipwood but I am not sure that it will provide enough shade. Hi Tania. Sorry, Australian natives don’t tend to have that canopy effect. Perhaps a dwarf Callistemon could be shaped to your liking? You’ll need to be wary of its proximity to the house. Engineers blame a lot of subsidence on trees. Thanks for the great pictures. I finally know what trees we have protecting us from the hot summer. The tulipwood is indeed hardy! Is it ok for these two trees to be only 1.2mtrs apart. The HP is a 25ltr and the FB is a 45ltr. Hi Marcel. No, it’s not ok. If you can dig one up and move it, you’ll be saving it from overcrowding. Thank you for your great blog. I dont want to be negative but you might have a typo in the family name of harpulia. I have a wonderful Harpullia Pendula in my front courtyard. Its about 16 plus years old. Its magnificent. BUT its driving us MAD!! When it flowers Nov – February it drops leaves, flowers and flowers stalks……I want to cut it out but it is so very beautiful, it is staining the sandstone around it and we have to have someone constantly cleaning… Is there a male and female tree and is it possible we have the female as I have noticed some around the area don’t flower. What can I do my husband want’s to cut it down. I would like to send you some photos for your other readers, it is a magnificent spreading tree.